If you’re currently living alone with your dog then leaving it at home whenever you need to school or at work is a usual scenario, but this could also lead to unfortunate situations such as your dog developing anxiety due to extreme loneliness. 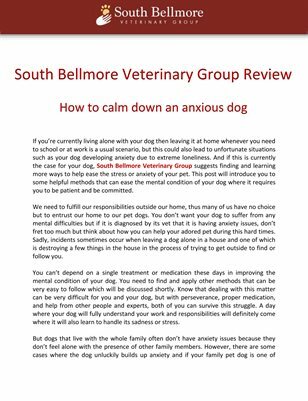 And if this is currently the case for your dog, South Bellmore Veterinary Group suggests finding and learning more ways to help ease the stress or anxiety of your pet. This post will introduce you to some helpful methods that can ease the mental condition of your dog where it requires you to be patient and be committed.